There aren’t many books whose covers I am ashamed to bare to the world as I read. I read a lot of self-help (Gretchen Rubin), pop culture (Chuck Klosterman), and anything I am drawn to when I walk around the Free Library. I also love to read collections of essays, like those of Sarah Vowell and Sloane Crosley—both of whom have made or will make Free Library appearances this fall. (Check out freelibrary.org/authorevents for the podcasts if you can't or couldn't make it!) There’s no literature I read that I wouldn’t really want to fess up to. I do have a favorite read—and have for years—that I keep more close to the vest: my trusty PEOPLE magazine. I’ve been hooked for as long as I can remember, enough so that my mom got me my own subscription when I left for college, which I held onto until switching to reading mostly online. 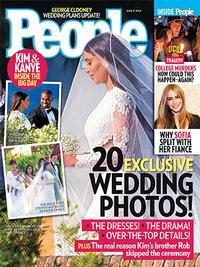 Whenever there’s a new issue of PEOPLE, I’m always pumped to carve out time to go through every page. I need that celebrity gossip, and I definitely need to finish the crossword puzzle before someone else gets to it. Any time I hear a dig about celebrity gossip—a la “Who cares what the Kardashians are up to?”—I secretly think to myself, “I do!” But sometimes I simultaneously feel bad about myself for this admission. I consider myself to be intelligent and well-read, but darn it, for whatever reason, I do care about Kim, Khloe, and their family members, and I feel like I shouldn’t have to apologize for that! They’re interesting, and you know it. So it will be my dirty little reading secret no more! So, fans of tabloid magazines, embrace your love of celebrities and their personal lives, and DON’T buy a copy of the New Yorker to stuff your PEOPLE inside to try to fool everyone on the bus or train (assuming anyone actually does that … If you do, I want to meet you). No shame! And for those of you looking for your glossy magazine fix without newstand prices, try Zinio to access all your favorite magazines digitally, for free! 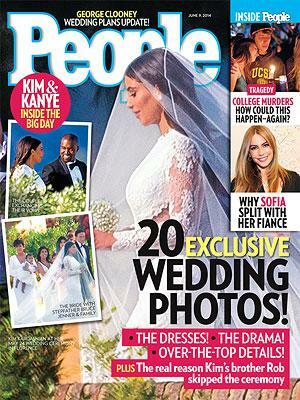 You KNOW you want to see Kimye's wedding photos!